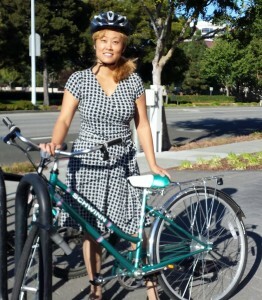 Today’s expert is Melissa of Bike Pretty. She blogs from San Francisco and has been featured by Refinery 29 for her excellent sense of style. What tips do you have for grooming hair for the office or after work events when you commute by bike? Consider your hair type and adjust accordingly. For fine hair, using a powder shampoo can boost volume. It works proactively by absorbing sweat and oil. It takes only a tussle with the fingertips to reactivate the dry shampoo mid-day. 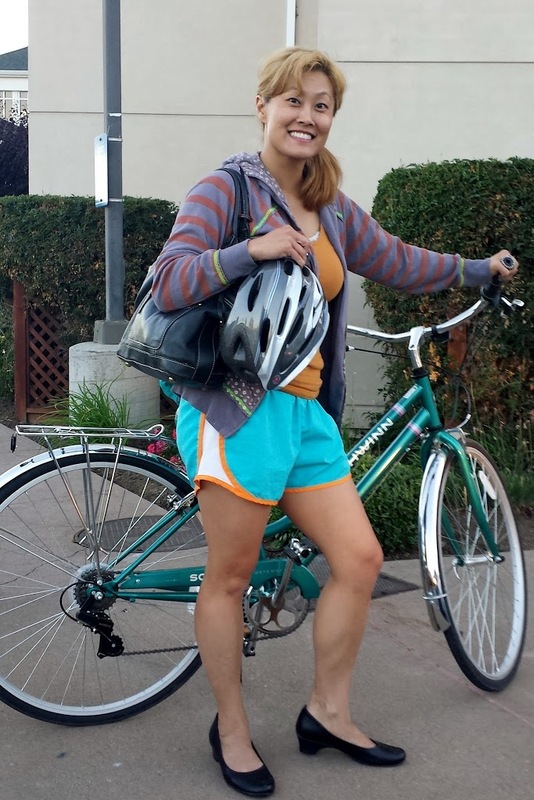 A friend who lives in Europe introduced this solution to Melissa since hairstyling as a rider is a daily habit for Bike Pretty. Process matters more than hair product though. For example, it may be counter-intuitive but freshly spraying your hairdo just before you put on your helmet will give you worse bike helmet-head. Instead, style your hair first. Be generous with the hairspray. Then apply your makeup and put on your ride-to-work outfit. Why? Because this allows the hair to set before you encase your ‘do in your helmet. If the hairspray is damp, you’ve only assisted the helmet in pressing your hairstyle into the shape of helmet-hair. Any fashionable solutions for caring for inevitable spills/asphalt wipeouts? Any cute office-appropriate bandages? Just as sequence matters more than product type, prevention is more important than aftercare. Not all bike accidents are inevitable. To illustrate, what are the two most common road hazards for bicyclists? Railroad tracks and gravel. Since railroad tracks run parallel to the bike path, oftentimes, wheels get stuck and the rider takes a spill. Steer your wheels at a 45 degree angle so you cross the tracks at a diagonal. As for gravel, even a thin layer of pebbles can cause a rider to skid. Prevention? Slow your roll. Slow down. Oftentimes, you are already breezing through a commute while cars are stuck in traffic. Allow yourself to slow down so you don’t lose control over loose rocks. Do you have a deodorizing tip to share? While many of us have gyms and showers at the office, what else can we do just in case we don’t smell nice? You might have to accept sweating as part of being human. Back, face and underarm sweat is just part of the deal. However, you do have ways to still smell pretty as a rider. Lots of solutions are borrowed from the discipline of dance. Yes, dance! Irish Step Dancers use underarm liners between their skin and their heavy costumes to deal with perspiration. This is such an example of functional beauty. Some of these liners are disposable. Others are washable and reusable. Also consider allowing yourself a 10 minute cool down period before you reach the office so the perspiration can evaporate. You might still have a rosy complexion from the ride but you won’t be as sweaty. Other tips? A change of clothes that includes a neutral office-pretty skirt, blouse and pair of shoes is a pro-tip. This saves wear and tear on your good workwear. In other words, you can wear your riding clothes and then swiftly secret yourself into the washroom to change at the office before your officemates see you. Emerge elegant! Reading riders, please don’t keep it a secret if you decide to accept the Fall Fitness Challenge. Will you go car-free starting this September and commute by bike to work for 30 days? 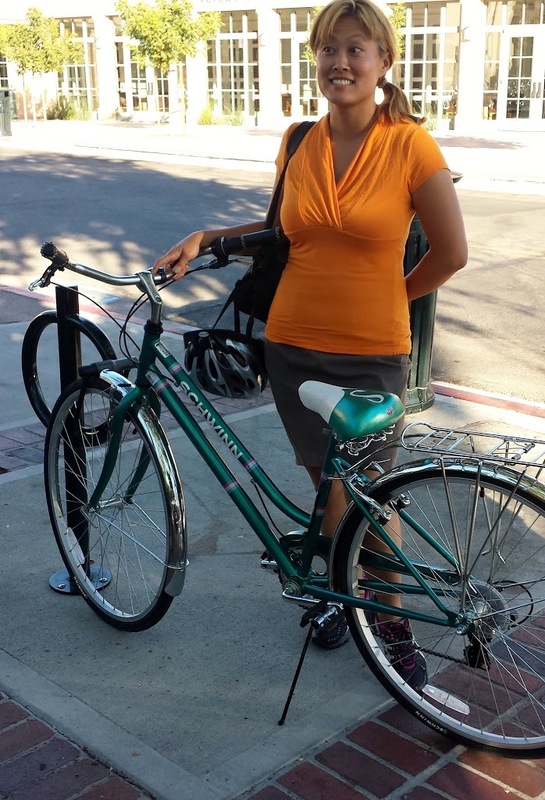 How might viewing your community through the eyes of a bicyclist change you? 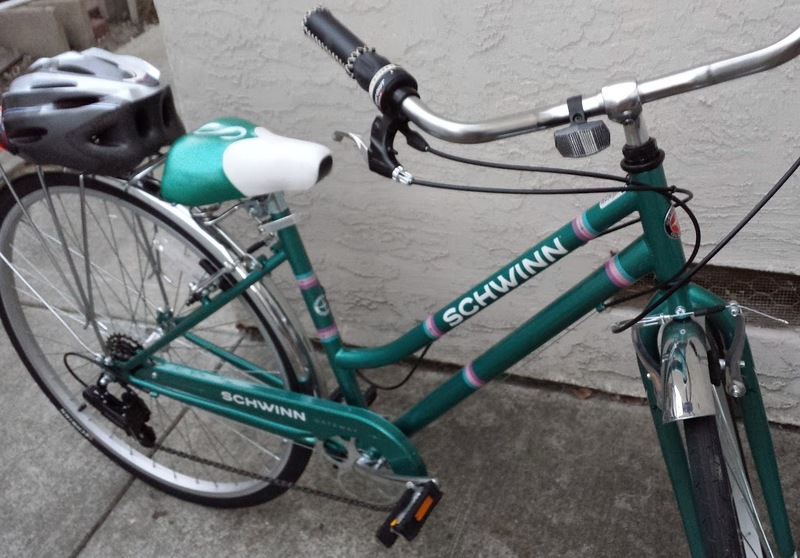 Will this experiment inspire you to advocate for changes for a more bikeable city? Tell us. Share your rider story, send pics, and win a prize by Thanksgiving! 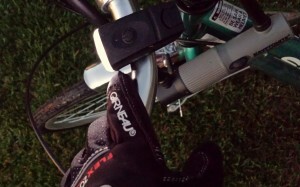 As a new rider, I was prepared for night riding with my front and rear bike lights on Sunday evening. However, I was not prepared for a bike chain slip. Was it a prank? Locked my bike outside the AMPM to buy a sports drink. Came out to find the chain completely messed up. Didn’t have my smartphone with me to look up a tutorial how to fix a jumped or slipped chain. Who came to the rescue? A family of 3, walking by, helped out a newb like me. The 9-year-old daughter offered to hold her dad’s items in her free hand without the vanilla ice cream cone. 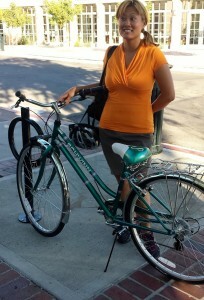 The mom held my Teal Tornado steady while the dad used his bare hands to reattach the bike chain. The real Incredibles live in my zipcode! Thanks, neighbors. 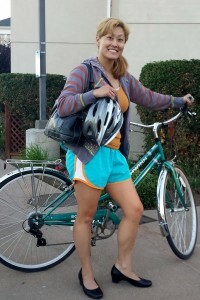 For more mad cuteness and Bike Pretty examples, visit Melissa’s Pinterest boards! 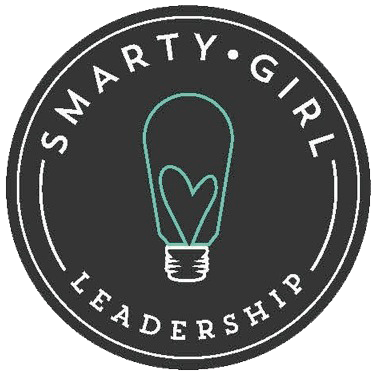 She welcomes any SmartyGirl or SmartyFella to contact her directly with new rider questions.